Distributor: Currently licensed for cinematic release by GKids, as an addition to Princess Mononoke. Notes: My thanks go to Nausicaa.net for different tidbits of information needed for this review. Note: This music video is available in a compilation DVD called Studio Ghiblo Shorts, together with various other Ghibli animated shorts. It's only available in Japan on an R2 disc, but in this case, you don't really have to worry about limited Japanese language skills to enjoy it. This DVD also feature an alternate song remix version for this video. 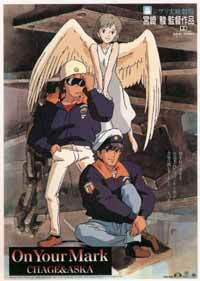 Upon raiding what appears to be a religious cult, the Saint Nova's Church, two police officers (Chage & Aska) find a girl with a rather angelic appearance lying tied and unconscious in an alley. As she is then taken to what looks like a lab of sorts, the two make plans to rescue her and set her free. Well, damn! I'm reviewing a music video. But then, seeing as this video is created by none other than the renowned Miyazaki Hayao, I could do no less. And WHAT a music video this is. Opening with a shot of a mysterious structure on a rather beautiful countryside landscape that is mysteriously marked with "radioactivity" warning signs, it quickly shifts to the main plot; the police raid on the building housing the cult, shown in a scene which richness in colors I haven't seen since the first Daft Punk video made by the almost equally well-known Leiji Matsumoto. Chage & Aska, our musicians in this video, are apparently two of the most popular Pop/Rock musicians in Asia. The song itself is a rather pleasant soft-rock tune. It isn't the most impressive piece of work I've ever heard, but it's relatively easy on the ears and I DO like it. In either case, the song certainly suits the video well. But then, the video was made for the song, so it's only natural. So, what we have is a pleasant soft rock song with a patented Miyazaki feature placed on it, and it fits like a glove. I'll admit I AM curious about whether this one will be released as a DVD feature, and if that, exactly how would that work. It HAS been released on laserdisc before, so it's not like it's completely unlikely it'll ever happen. In either case, it'll make a VERY nice bonus on a future release of one of the other Miyazaki movies, or even some sort of promo DVD, like the video was intended to be for the artists. But I guess we'll just have to wait and see. I'm hoping they do SOMETHING at least, because I wouldn't mind owning this marvelous piece of work. Recommended Audience: Teens and up. There's a semi-violent gunfighting scene at the beginning of this video. And while we don't see anyone being hit, there are a lot of dead cultists lying around after the initial scuffle has ended. Outside of that, though, there isn't anything worth mentioning.